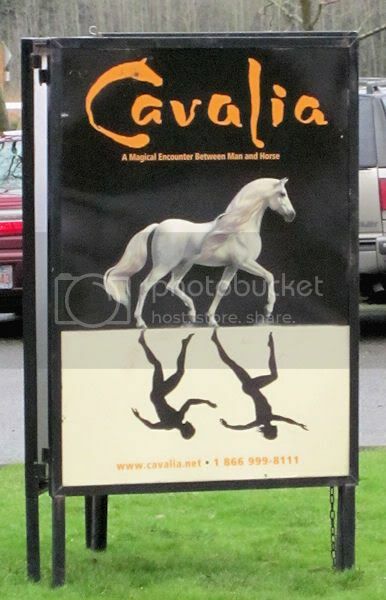 This past Xmas, my uncle surprised us with tickets to a local event: Cavalia, a touring equestrian/acrobatic show in the vein of Cirque du Soleil. With Grandpa's mental and physical state iffy at best, and relatives just plain unpredictable, we weren't altogether certain how it would go. But it was a Family Thing, and who knows how many of those we'll have before the Family is less complete than it is now? The weather, as one might surmise from the photograph, wasn't particularly promising. 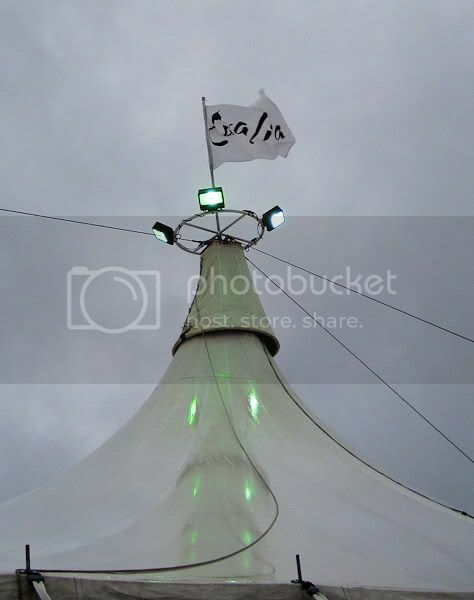 Online reports indicated that the tent was climate-controlled, at least. We showed up about an hour before showtime to wait for relatives and gather tickets - a smart move, as the lines grew exponentially longer by the minute. Fortunately, the rest of the clan had the same idea, so we didn't have to stand around outside waiting. Also fortunately, Grandpa was in an "up" mood, relatively alert and mobile. When we got inside, we discovered that our seats were closer than we'd anticipated - only about seven rows back, if off to the side. The online seating chart warned that these were "partially obstructed" views, but the stage looked plenty big enough for that not to be a problem. Meanwhile, we were wondering how to get Grandpa and his walker up the stairs to our seats. The problem solved itself before it was encountered; the staff, taking note of his mobility, offered two front-row floor seats for him and a relative. My horse-nut sister opted to sit by him, while the rest of us settled into our "partially obstructed" seats amid the growing crowd. To cut a long story short, the show - after a bit of a slow start - proved magnificent. We failed to see how our view was in any way obstructed by anything. My only complaint was that they could've routed traffic better during the intermission. (Well, that and merchandising selection, but then I'm often disappointed with merchandising selection. Didn't stop me from buying a keychain, though...) We were all impressed - even Grandpa, who was more talkative than he has been in many a moon. Dad declared it the most spectacular thing he'd ever seen in his life - which covers more than 80 years, so that's saying something. As for my horse-nut sister, she came home with a keychain, a pictorial program, and the deluxe book. All in all, this was probably one of the best belated Xmas gifts I've ever received. Well, it's been a few days, hasn't it? If not for you, then certainly for me. The short story is that the snowstorm mentioned in my previous post took a turn for the nasty, leaving us without power for 5 1/2 days. When last I left me, on Wednesday afternoon, I had returned home from an abbreviated workday, braving nearly-deserted roads. 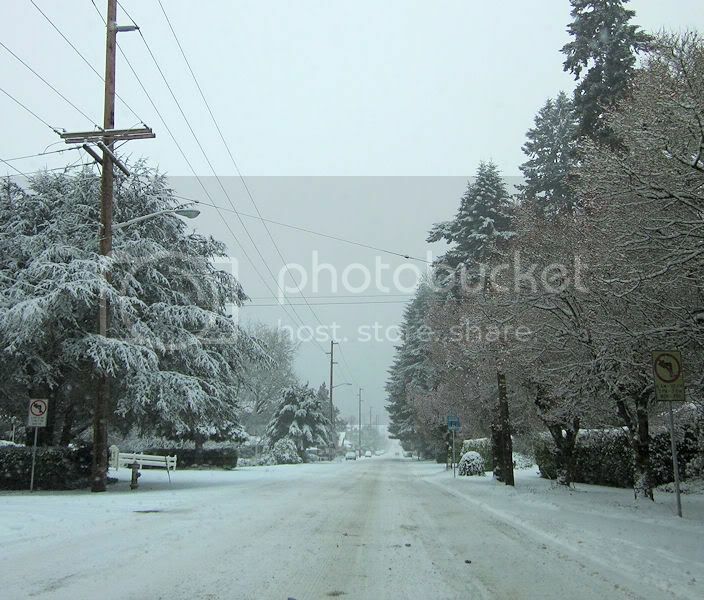 At the time, it was just a snowstorm... if an unusually heavy snowstorm for our region and altitude. I figured we'd get a good coating of crystallized rain and that would be that. So, evidently, did the weather people. As the storm wore on, snow began turning to ice. Ice, as one might know from science class or personal experience, is heavier than snow. Late on Wednesday night, at almost 9 on the nose, the power died. We gave it a few minutes to see if it was just a hiccup, but it wasn't. Not a problem, we figured. It had been years since we'd had a multi-day outage. Since the nearest town went from being a bedroom community to a full-blown city in its own right, we tended to be in a higher-priority area than we used to be as no-name suburban-country hicks. Besides, we had a gas generator. While it wasn't strong enough to run the well pump, it could run the furnace or the microwave (or a freezer). We had some bottled water and some nukable dinner options. By the time I went to work on Thursday, we'd be back up and running. Sure enough, at around 4 AM, I heard the power come back on. It's strange, listening to dead silence - one is almost startled by the sudden resurgence of hum and thrum and buzz, the nearly subsonic breath and pulse of our modern electrified age. I quietly rejoiced, as much for the power as for the realization that I had a few more hours of sleep before the alarm went off. I woke from a half-doze two hours later to a rising silence. The silence of the dark. Crawling out of bed, I managed to make do with a little leftovers from the hot water tank and a bucket. In the meantime, Mom emerged from her room with a radio news update. As bad as driving was on Wednesday, Thursday was worse. The roads were sheets of ice. Branches and trees (and power lines) were dropping left and right - a fact I could personally attest to, with half a minute's listening. They had even invoked the Emergency Broadcast System to tell people to stay home unless they absolutely had to leave. I called the closure line at work, thinking I'd hear the same story. Instead, I was informed that work would be starting at the normal time... which gave the roads about an hour to shape up. 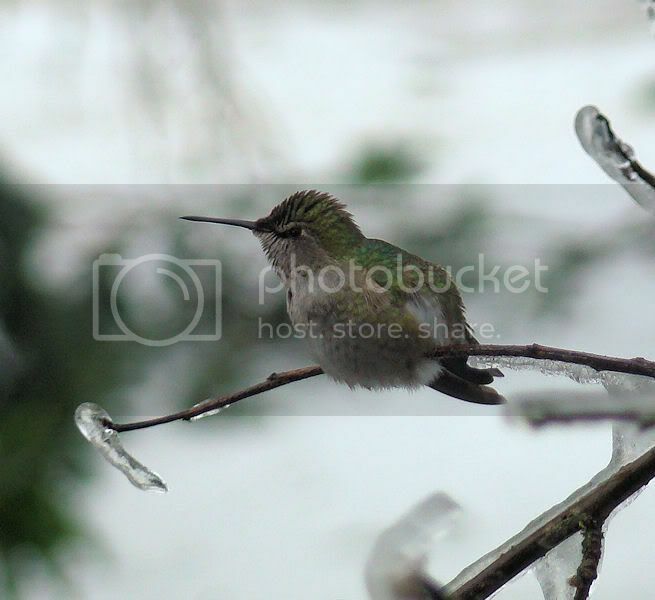 Peering into the driveway, I saw my car encased in ice. Literally encased. 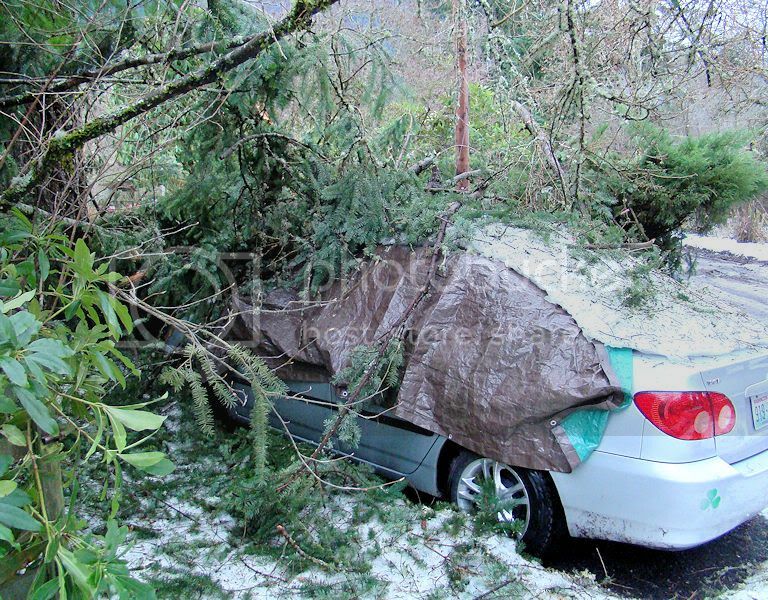 I watched a massive limb crash down from the Douglas fir in the yard... adding to the pile already on my mother's car. I poked my head out the front door and found the stairs to be impassable. I called work back a half-hour later and told them I was unable to even reach my car, let alone drive in to work. The tech on the phone didn't sound surprised; several people had already called out, and they'd just lost power anyway. So I found myself with an unexpected day off. I don't know why I found myself buried in my Kindle. Perhaps I've worked for the library long enough that my subconscious demanded I spend my day among books, if not slinging them then actually reading them. And, really, there wasn't much else I could do in a dark house. No computer, no internet, no TV. But at least we had heat. And power couldn't be more than a day away. Even if Dad had forgotten to fill the gas can before the storm hit, leaving us with half a tank of gas against a day and a night of ice and snow. Even if our upstairs fridge was rapidly defrosting. Even if my mother's car already had one dangerously large branch draped over it, with more raining down as the day progressed... enough that we didn't dare check for damages, because even a small branch off this monster tree would be lethal. To further complicate matters, that afternoon the largest branch we had yet seen dropped from the heavens. This thing was large enough to be its own tree. As frightening as it was watching this fall, with hardly a crack to announce its sudden departure from the greater trunk, its fall was capped by an almighty crack against the wall. That crack was the end of our phone line whipping back against the living room window. With ice-encrusted roads, power lines down on either end of the street, dropping limbs (which we later learned actually killed a neighbor, if not one we knew by name), and now no phone, we were effectively isolated from the outside world. Worse, word was that power crews were actually being called back from the job due to dangerous conditions. On Friday, the ice storm itself was over. Limbs were still falling, but new ice wasn't accumulating. Temperatures were set to rise over the day. Things had to be improving. Had to be, because I had a job to get to, and no way to even call in to find out if we were still on early-start (as we'd discussed on Wednesday.) I tried my cell phone, but the nearest tower was out of service. Nevertheless, I dutifully chiseled out my car. Someone had to make a run to civilization, for water and more food if nothing else, and be danged if I was going to give up before I even tried getting through to work. The downed lines were still down, but I knew a way out to the main road through a nearby church parking lot. Unfortunately, so did someone else...someone whose 4 x 4 had torn up the road so badly I danged near got stuck. But I had to get out, and there was no turning back, so I coaxed the Golden Taurus down to the (thankfully plowed and sanded) main road. It was more of a controlled slide than a true drive, as my poor car wallowed and ground its way in the direction most favored by gravity. I made it, but realized even as I did so that I'd committed myself - I could never get my car back up the torn-up road I'd just come down. Hell, I wasn't sure I'd even get the car back up the road to my driveway. But here I was, and here I must remain. As I rolled through town, I noticed a couple of things. The power was out at every business, and the roads were still almost empty. When I saw that the local library was pitch dark, I suspected that I would have no work to do if I drove out to the shipping facility. I wanted to try calling again, but I needed a place to pull over and check for cell service. Unfortunately, the plows had buried the parking lot entrances to every store along the main road. I'd already pushed my luck on my slalom-ride down to the main road; no way I was risking my undercarriage on an unplowed parking lot. When I finally hit working stoplights across town, I found a gas station whose patrons had helpfully compacted the plow-dam enough for me to pull off. Finding I had a signal, I called in to work to find out what the hell I was doing in the middle of a deserted town at 7:45 AM. The phone at work rang... and rang...and rang. This doesn't happen - either someone picks up, or the answering machine kicks in. And we were supposed to have started work at 8 AM. I'd already risked my car getting this far. At the very least, I'd swing by a store to pick up some more supplies before throwing in the towel. The nearest store was wide open. Literally - doors standing open to the weather. I thought it closed - the parking lot was nigh deserted, a rough and laneless stretch of tire tracks and slushy ice. But the lights were on inside - generator lights, true, but lights nonetheless - and I saw someone come out with a shopping bag. I went in and managed to grab water, some more food, and even a sack of litter to grit the stairs (one of those things I thought for sure we had when I was stocking up for the storm, but which I'd evidently hallucinated.) Sitting in the parking lot, I gave work another try. Twelve unanswered rings answered my question: I was not going to work today. I was also not sitting in the parking lot for another hour to keep trying. I'd forgotten to grab the gas can before I went - I had thought I was going to work, after all - but our neighbors had made the matter of generator fuel moot; they offered us an extension cord from their commercial-grade natural gas generator. It powered everything our gas furnace would've done, allowing us to save the half-tank for a rainy (or snowy) day. Another day of reading gave way to writing: I'd backed up four book reviews, and wound up writing them out longhand so I wouldn't forget my thoughts on them. If nothing else, this outage was sure clearing up my Kindle reading backlog. Later that night, I pressed the Little Black Critter into service typing them up in Notepad, so I could cut and paste them online when the opportunity arose. Then I read some more. On Saturday, we were ready to break. Two and a half days trapped together were threatening to turn this little outage into a crime scene. And it was two and a half days too long without access to a proper shower. (There's only so much one can do with a bucket of icewater and a washcloth...) Fortunately, my grandfather's unoccupied house had power, and by now the roads were much improved, if not entirely clear. So we piled ourselves, our laundry, and our soap into the Golden Taurus and struck out for brighter skies and warmer water. Which brings us to Saturday night, as I type this on the Little Black Critter, by the light of a lantern dangling from the edge of a shelf. With improving conditions, the power crews have made great strides in restoring electricity. Why, just this evening, I called their automated line for an update on our outage. We were told that power was expected to be restored by 8 PM this very night. It's 10:53 PM as I type this... by the light of a lantern, in my darkened room. Oh, well... at least I got my shower today. My hopes, raised so high last night, of an impending resolution to our power problem grow decidedly dim. Before, the power company outage hotline was able to give us a plausible cause and approximate time that we could expect our electricity back. This morning, waking to find the house as dark and dead as it was last night, I called again. While they inform us that the outage is on their books, they claim that the cause is a "tree falling on the lines," and that they are unable to even speculate on a repair time. On the plus side, the roads are bare, and ice only lingers in patches on the driveway and lawn. This morning, the neighbors helped us extract Mom's car from the branch fortress that had formed around it during the ice storm. Despite my fears about the state of the hood, the car started up just fine. (The "Maintenance Required" dashboard light didn't even turn on. I guess the car thinks it's perfectly healthy, despite the shattered windshield and cracked light and dented hood. I never have trusted those catch-all lights...) This bodes well for the repair bill and work time, at least. Later in the day, we headed into town to pick up a prescription for Mother. It didn't go well... the blood pressure meds she needs were once again denied. This time, Mom went in and demanded an explanation. After playing phone tag with doctors and insurance, the pharmacist was able to answer the question that had plagued her since November. While the new doctor's office has flubbed a bit, and her doctor didn't always follow through, the bulk of the blame lies squarely on the weaselly little shoulders of her insurance company. They did give mother a prescription for another blood pressure med that the company approved of - one that she swears she's tried and which didn't work for her, but at least it's something. So at least now she knows who to yell at. We grabbed batteries and more illumination devices at Freddy's, including the cheapie head lamp that's currently illuminating my keyboard. Too cool... Then, we grabbed lunch at Wendy's. While there, we heard two guys thanking the employees profusely for being open. I guess we aren't the only ones still without power around these parts. After lunch, we hit the gas station (for the car and the generator can), and headed home. Where Mother promptly realized that she'd left her purse in Wendy's. Her purse with her cell phone and her money and her everything. Unload the car, and I drive her back out to search for the thing. Fearing the worst, I went in to ask if someone had found a brown fanny-pack purse. A tense wait, as people talked to people. Then a miracle. Yes, they had it! I threw a dollar into the donation jar at the counter and returned in triumph to the car. When we got home, we called the power guys again. Same story, same non-answer. Funny thing is, we saw no trees down between the dark houses and the illuminated houses on our drive out of town. Either of them. My guess is that they're giving us the brush-off; we should've come back up with the rest of the people they restored last night, they don't know why we didn't, and they've therefore dropped us to the bottom of the repair list until they deign fit to bother with us lowly little peons who aren't worth their prime time. Our fault for daring to be their customer, I suppose. So now it's 8:27 PM - over 24 hours past when we should've been repowered - and I'm typing on the LBC by the twin illumination of a fluorescent lamp and an LED headlight. And now I can't find my little purple flash drive or my cheap tiger mouse pad from my laptop case. And we're going to have to chuck most of what's in the fridge. And I'm really pissed off at the power company for forgetting about us. Please, please, please, Master Water Dragon, whose year of honor commences tomorrow... do be kind and help us start your year well! Another day of broken promises by the power company and frayed nerves in the household. The sun was shining on the last of the snowmelt, with bare roads and rising temperatures. At the cat vet, where I was grabbing more food for one of my boys, I mentioned that we were still without power. The lady at the desk said that she lived much further out than us, and she had power. When I called the power hotline this morning to check on our status, we were given an ominous message about how they didn't even want to hear about it unless it was an emergency. I think they're just sick of hearing from us. This evening, we grabbed a pizza for dinner. We fervently hoped to see the annoying garage light on the way home, the loud and buzzing and always-on thing that heralds whether or not we have power. Tonight, we were given a deadline of 11:30. After midnight, the neighbor's generator stopped providing power, but their house is dark, as is the neighborhood. We fired up our puny gas generator, so at least we won't freeze. Dad called for an update. New time? 8 AM tomorrow morning. Today, at least, the phone company was due out to fix our phone. When, they couldn't tell us, but some time between dusk and dawn seemed the most likely time. While Dad waited for them, the rest of us piled into the faithful Golden Taurus with a bag of laundry and headed back to Grandpa's, also known as the Oasis of Warm Water. Showers and laundry (and lunch) accomplished, we came back home - this time returning by our usual route, the one that was denied us by road closures on Saturday. Our private road lies off a "horseshoe" spur, touching on the main road at either end. Usually, we only see one half of it in a given day - the half that leads to the nearest town. Our return trip took us up the other side. We finally understood why the power company was having trouble. Even now, five days after the storm, the place was an almost-impassable disaster zone. Half the lines that could be knocked down were. Piles of debris and branches that were practically trees themselves lay alongside - and even in - the roadway, choking passing to a narrow single lane at one point. Needless to say, 12 passed without so much as a blip from the power lines. My sister went off to attend a continuing education class she'd signed up for a month ago, taking my father along to help navigate. (He's freakishly good at navigation, as he's freakishly good at waiting for tech guys and other tedious tasks.) Mother and I went out to look for more batteries, as our supply was running dangerously low. On our way home, I saw a glimmer of light from the main road. It was too much to hope for. I held my breath, biting my tongue, as we crept up the road and into our driveway. Our motion-activated lights gave us the best welcome I've had in many a moon. And thus ends the Great Power Saga of January 2012. Given weather patterns, I have a bad feeling that it won't be our last brush with the darkness before the winter ends. In the meantime, I have five days' worth of websurfing to catch up on, and eight new book reviews to format and post. Oh, yeah... and work tomorrow. When I was young, snow on a weekday meant eagerly listening to the radio, holding our breath as the list of closures and delays was read off - or, sometimes, watching the morning news on TV as the little bar beneath the babbling anchors scrolled through names familiar and strange. Closures were best, of course, but a delay meant little more than a change in routine. It was too late to actually crawl back into bed and get more sleep. In truth, as someone to whom crawling out of bed in the morning was never a pleasant task, it was rather annoying; if I'd known beforehand, I could've at least slept in. Today, work had called for an early start, as the MLK Weekend "storm surge" was due to strike. The weather gurus, however, have been muttering and mumbling about a Major Snow Event, the potential for a foot of snow today, with possible winds. Around here, we take our weather forecasts with a steamshovel of salt, but - sure enough - this morning I woke to see a fresh layer of white across the yard, and fine wet flakes still sifting down from the great flour sieve in the skies. Now, I know what work is not school. We grown-ups are expected to risk our necks on icy roads amid our fellow grown-ups to get to our jobs, trivial as they may be. And the library is, technically, government. They don't close down unless they can't get the doors open, or unless the power's out. Still, memories of school days, of the golden "C" word, prompted me to call in before I took the time to excavate my car from the driveway. We have a one-hour delay, after which we lowly part-timers are to call in and check to see if the facilities are opening at all. So, I crawled out of bed on maybe 5 hours sleep for nothing... and, once again, if I'd known beforehand, I could've at least slept in. (Did they make us go in? Even when nobody else made their employees go in, except maybe Metro and the Post Office? Did they make us drive on icy roads that were almost entirely devoid of other vehicles? Yes. Yes they did. For all of 2 1/2 hours. Turns out that most of the rest of the library system was closed or intended to close early, so it was pointless to keep us there any longer. Tomorrow we finish the holiday load we were supposed to do today. And Friday we get slammed with snow-day catchups.